Per the cherry blossoms in full bloom, spring has sprung on the west coast. It is also in full bloom at Anthropologie. This post is a dedicated roundup of Anthro home items to help usher the new season into your space. 1. Blooming watercolor wallpaper // Would look great in a kids rooms, or in a powder room. 2. Colorado footed bowl // Great centerpiece on the dining table, or use for a pop of color along the kitchen counter. 3. Patterson chair // My chair obsessions are real. Would love to own a store with nothing but chairs to mix and match! 4. Pierre bar cart // Elevate your bar cart with a touch of terrazzo and muted pastel palette. 5. 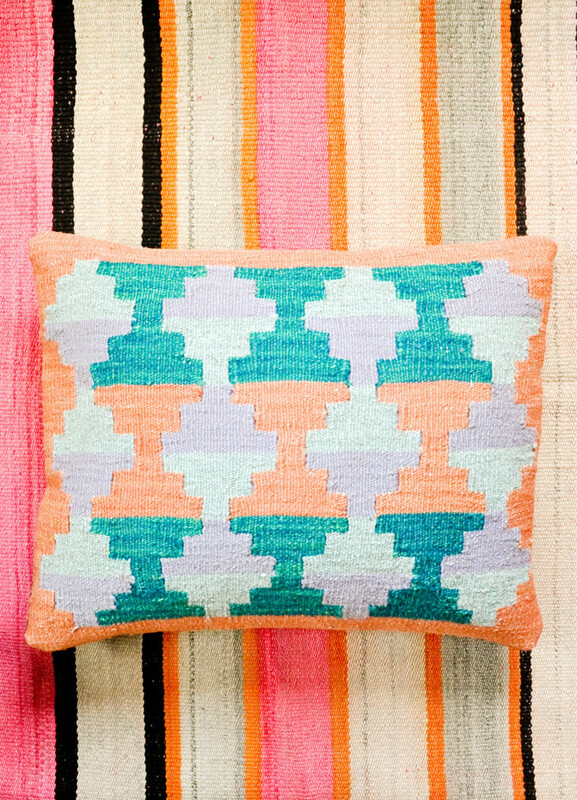 Woven edna pillow // I can't have roundup without including a pillow! Chunky texture, yet comfortable feel. 6. 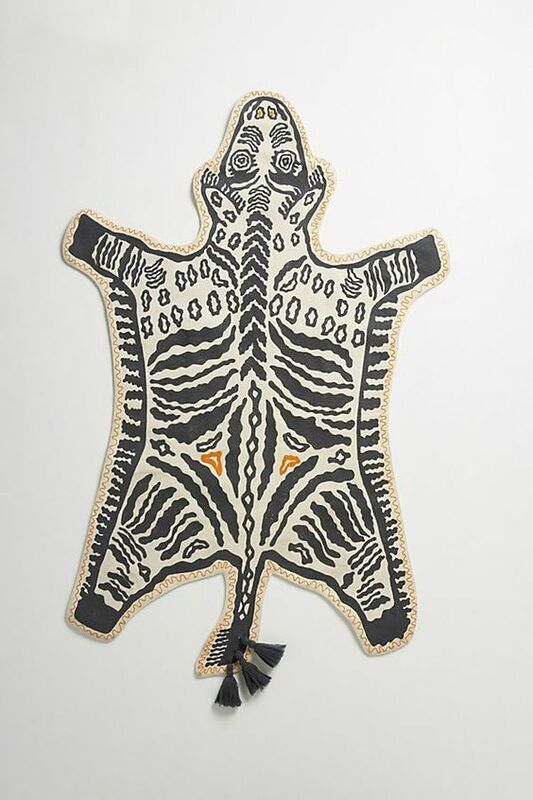 Hand-embroidered safari rug // Layer over a larger neutral rug, use as a stand alone next to your bed, or in the bathroom. Endless possibilities for this fun piece. 7. 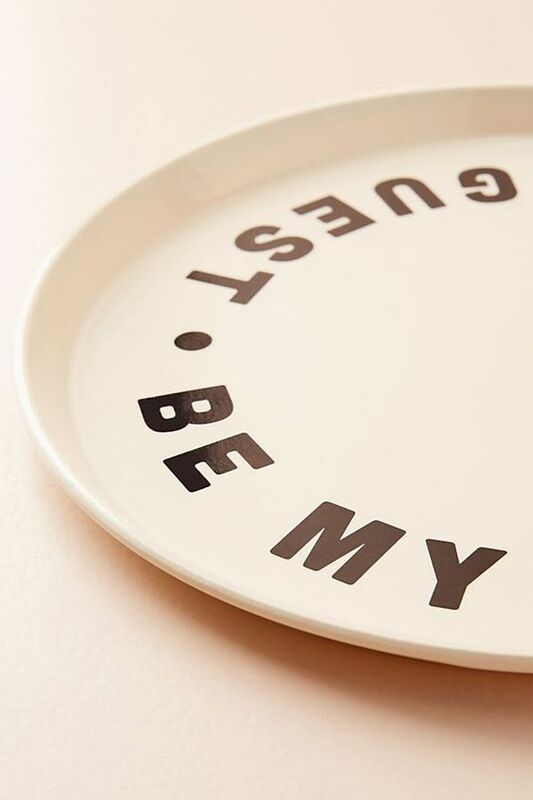 Be my guest decorative tray // How cute?! Use it in your guest bedroom as a catchall or serving tray. 8. Kalmar armchair // Another chair, for another lounge opportunity. 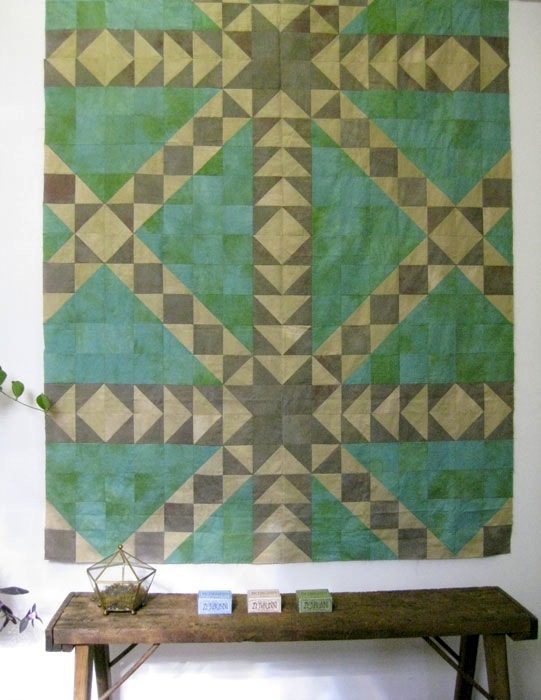 Love the design of the reclaimed wood and fabric choice. Bit of a traditional modern feel. 9. 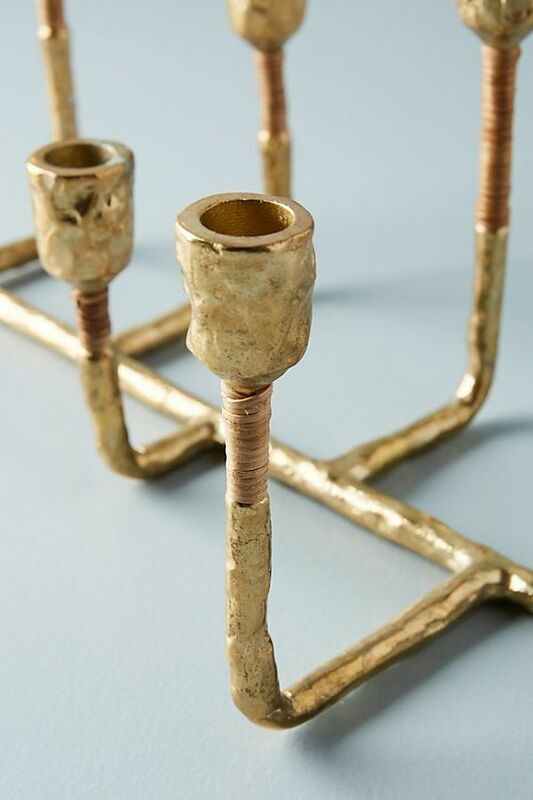 Laura taper holder // Always good to have a beautiful candle holder on hand. It's fancy without being fussy. 10. Zephyr dinner plate // Stoneware is having its moment! Affordable, dishwasher safe, and you can mix and match colors as you please. Moody jewel tones to bright pinks with metallic finishes sets the tone for this post. Additionally, each piece expresses the melding of new (modern) and old (traditional), and how color truly sets the overall tone of any space. While this palate isn’t for everyone – it is a welcomed juxtaposition to minimalism or the Scandinavian-modern style that has reached every corner of the interior design world. Don’t get me wrong- I LOVE Scandinavian-modern, but I have yet to successfully live in such a minimalist space! Cristina Celestino ottoman’s are a modern update in suede and leather – almost too beautiful to want to sit on or rest one’s feet atop. The vintage pair of wall lights from the apartment are hot pink fringe. Need I say more? If you are looking for a comfortable and totally lounge-worthy sofa, Toward designed by Anne Boysen is for you. It comes in five color combinations and features solid oak legs, and brass or aluminum “shoes.” Now depending upon how bold and beautiful you want your space to be – you can continue with this color palate regarding your rug choice, or you can bring-in some neutral texture to let your furniture and other objects stand out. 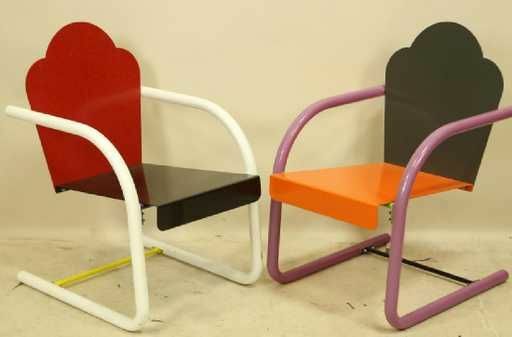 And bring some saturated color to your outdoor area with this pair of peter shire painted metal chairs. Floral patterns keep coming back, or perhaps they have never left. 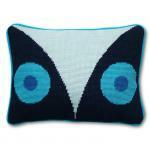 And they are a refreshing pattern to infuse throughout your home in the warmer months. As a personal preference regarding furniture, textiles, and the like, I gravitate AWAY from muted large floral patterns circa the late 1980s through the 1990s. I love the patterns that invoke a midsummers party, Botticelli paintings, hand-drawn animals, and the like. Scroll through for current favorites to update and refresh your space for summer. For a bold and beautiful statement, the ARTEMIS Wallpaper Amaranth Pink by HOH x William Morris is divine. 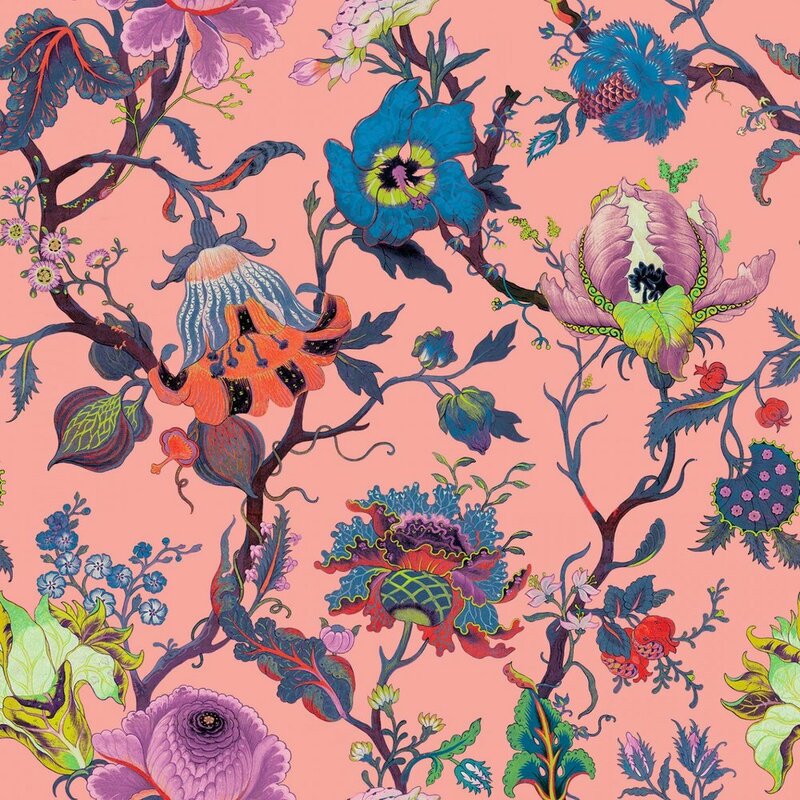 This wallpaper would work well in a dining room, hallway, or powder room. 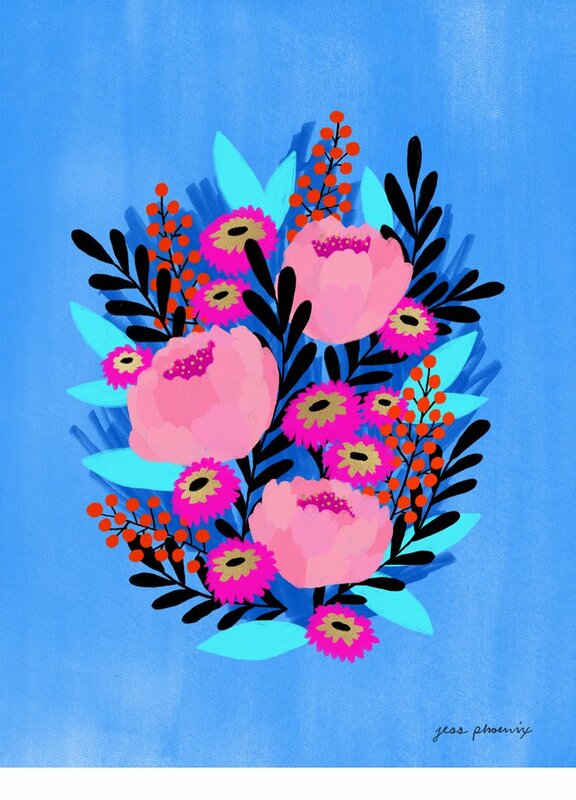 If wallpaper is too much of a commitment: hang an original acrylic piece by Jess Phoenix. 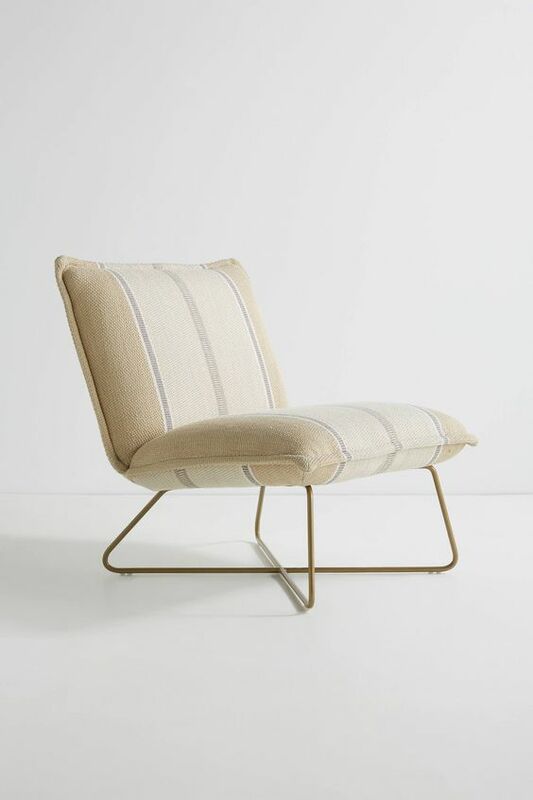 The Branded Stripe Losange Chair is a modern-traditional and monochromatic nod to fauna. Another chair, because one isn't enough: the floral accent chair that works year round. Comfortable for lounging as well. 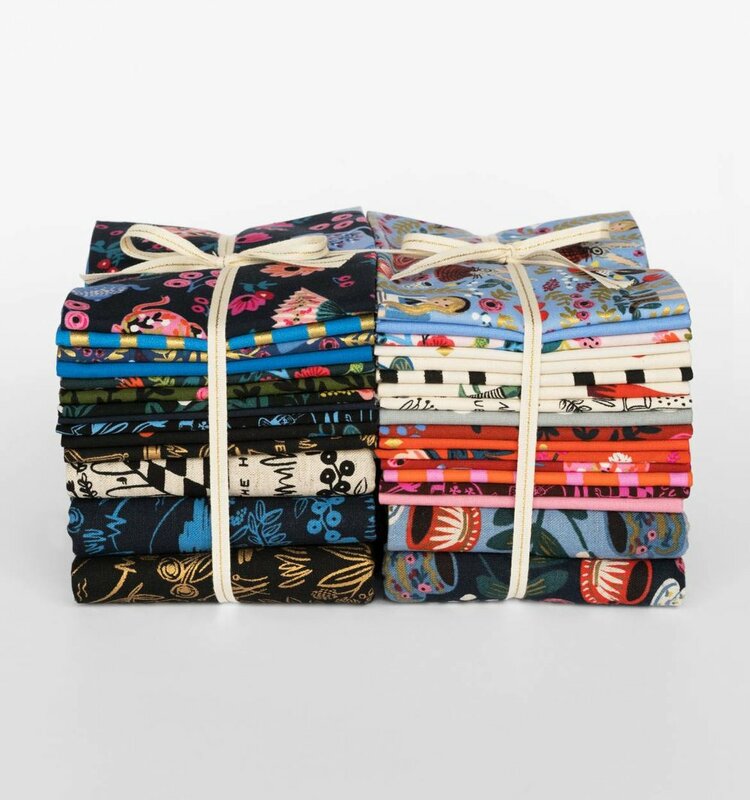 Rifle Paper Co. offers fabric in addition to their beautiful paper collections. Grab their new Wonderland Collection fabric bundle to create any and every type of textile one can imagine. This collection features floral, fauna, and delightful geometric patterns in rich colors. 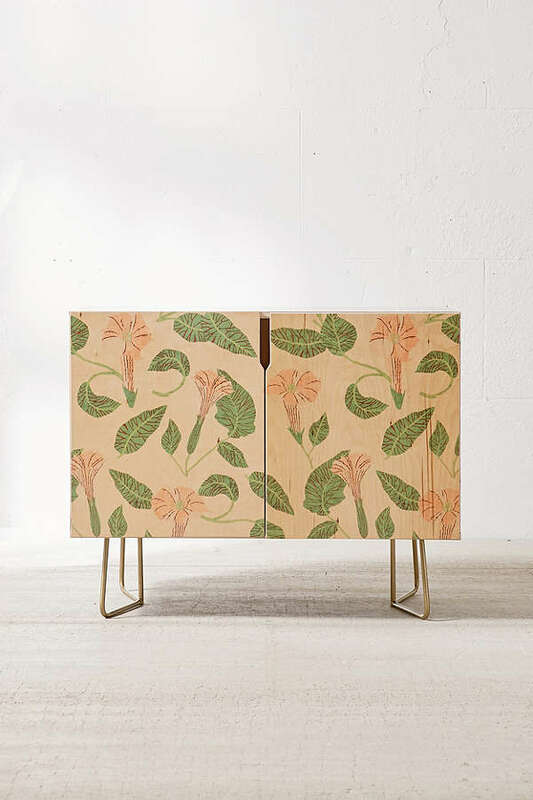 Holli Zollinger designed the versatile Deny Desert Moonflower Credenza. Its metal legs are removable and features an adjustable shelf inside. Rounding out this list of flora + fauna is the Holy Mountain Embroidered Coverlet by Aelfie. It's bold, beautiful, embroidered and for both adults and kids, or perhaps the adult child!! The Pantone 2016 colors are subtle, muted, yet charming and playful colors. While slated for this year’s colors, their subtle and charming nature allows for them to stay relevant for much longer. In this color punch round up, the focus is my favorite of the two colors, Rose Quartz. Who doesn’t love a light pink that is versatile enough to act as the main color or accent on textiles to wall treatments, as art or objects, and for furniture. Starting with the perfect mix of modern meets traditional, the linen glenlee sofa is beautiful as comfortable. Douglas and Bec's Line collection of lighting (table to floor) offers an elegant rose quartz light, which utilizes hand blown glass. For under foot a wool Moroccan rug with complementary colors provides a minimalist geometric focal point to your space. However, its texture and color can also be paired with furniture objects that provide a more boho energy. And because my pillow obsession and collection is real, the dash pillow from leif shop is super soft thanks to its merino wool fabric. 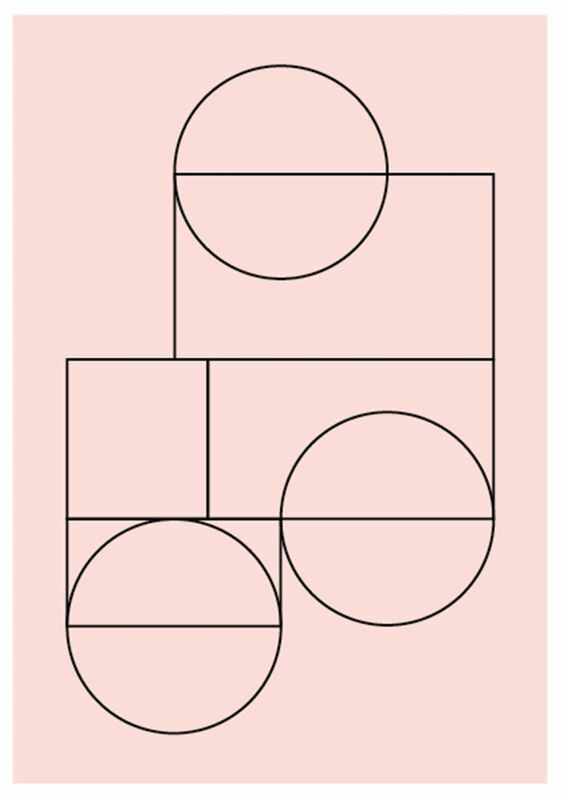 Rounding off this round-up is a beautiful print by Lene Norgaard. Rose Quartz, a subtle yet powerful color punch. Tile isn't just for the bathroom and kitchen. 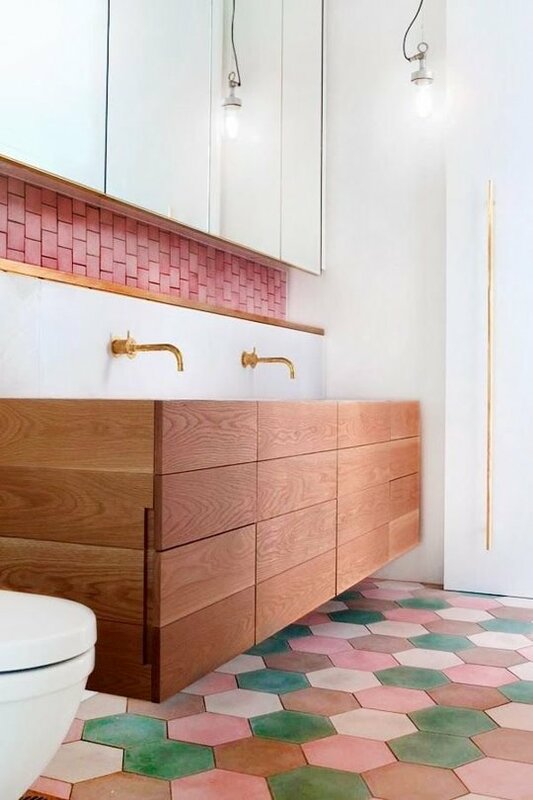 Whether you go bold with color and pattern or streamline and traditional, tile is a great alternate flooring (or wall!) option to hardwoods and carpet. A large part of tile is the pattern created from solid color tiles or patterned tiles. Adding another dimension to creating pattern, is using curved ceramic tiles. Marazzi Progetto Tiennale via Archiform has beautiful curved ceramic tiles that spark a dialogue between present production and their inception in the 1960s. Additionally, they can be used as wall or floor tiles. Now for those that truly embrace the bold- sitio by commune slash tiles are amazing. They have a limited color palate, but the geometric pattern created is a tile trend worthy of lasting a lifetime. The herringbone pattern is quite traditional, but when executed in a bright color, the result is a classical revival (modern!). Another option is encaustic cement tile. It can be used for both floor and wall tiling, and has a nice smooth feel to its surface. And for those that love traditional Spanish / Mexican tile, Latin Accents is a great resource for sourcing. For this round-up of color-punch textiles it is all about rugs. Rugs are a great starting point for setting the tone of a room. I tend to love rooms with neutral tone furnitures with lovely wood accents, leaving the bold and geometric colors to the textiles. 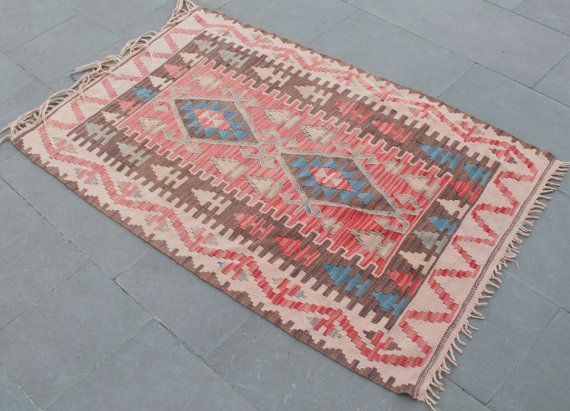 My current favorites are woven rugs featuring beautiful pinks and oranges. These colors add warmth and a focal point to a space and are a design classic. Moroccan and Turkish rugs have long been my favorite woven rugs, and luckily they are more available in the States. The 1970s vintage pink one featured is perfectly worn and would look beautiful in any room. A slightly muted and variation on a theme version can be found at urban outfitters. And I couldn't resist the playful boobie rug from cold picnic. Who doesn't love a little humor in ones space? 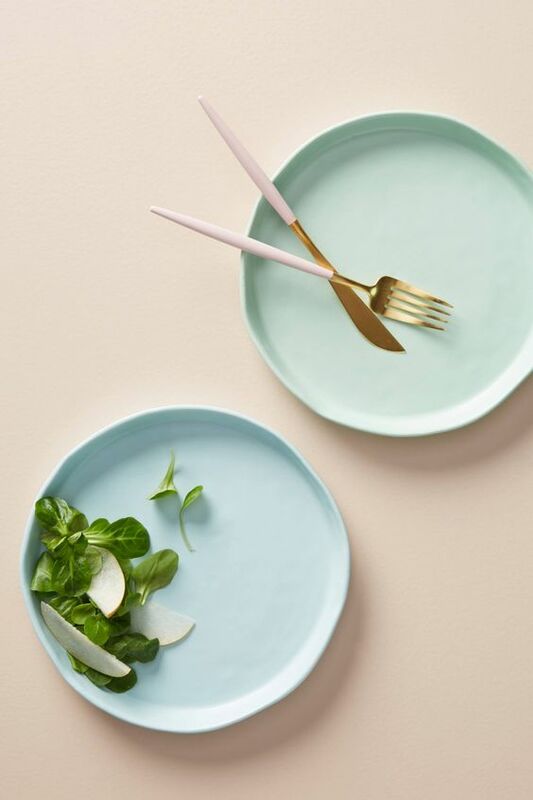 From home accessories, to textiles, lighting, and furniture, pastels have arrived. Pastels invoke warmth and a soft glow into the home. And the perfect complement to the soft touch of pastels is marble. For this color punch round-up of pastels and marble, lets begin with Firm Living's latest collection of Kelim Carpets. 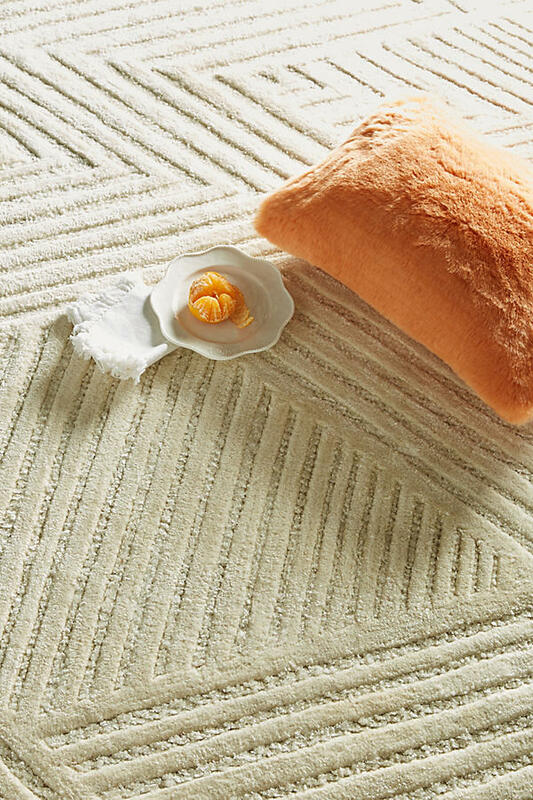 These wool and cotton carpets invoke a relaxed mid-century vibe with muted pastel and earth tones. Hang on the wall as tapestry inspired art, or under foot. They add relaxed elegance to ones space. A complement to the softness of the Kelim Carpets is the Annex table (side & coffee) from Joe Doucet x Partners. These signed and numbered limited edition tables are snap fit in configuration - letting gravity hold them together. I love their angularity and the subtle 'x' remaining after configuration. Anthropologie's House & Home line has made a great debut. 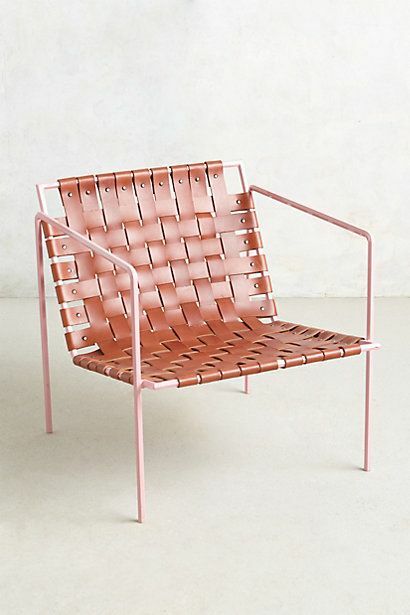 The Rod & Weave chair is no exception. The gorgeously woven leather seat with pastel colored iron frame is a great combination to showcase in your home. For table lighting with mid-century lines and a marble base there is the Clint Mini Task lamp. It works in the living room, on a pile of books in your office, or next to your bed. Personally, I like both upholstered and leather sofas. However, for pastel hues I would stick with fabric, and leave the natural tones for leather. Pastels aren't just for art anymore. It's that time of year again- time to switch out the textiles, rearrange some furniture, and hang a few new pieces of art. Now, its not fall yet, so no need to break out the heavier textiles. But it's the twilight of summer and I always find myself wanting one last burst of bright textured color to recreate each interior landscape. I am a fan of slip-covers on couches. And they are a great way to change the feel of a space. I tend to go with a white or light colored slip-cover in the summer so I can punch up the blankets and pillows with pinks, aquas, greens, and oranges. Not a slip-cover fan? Then this multicolored lacquered steel chaise lounge is your alternative. 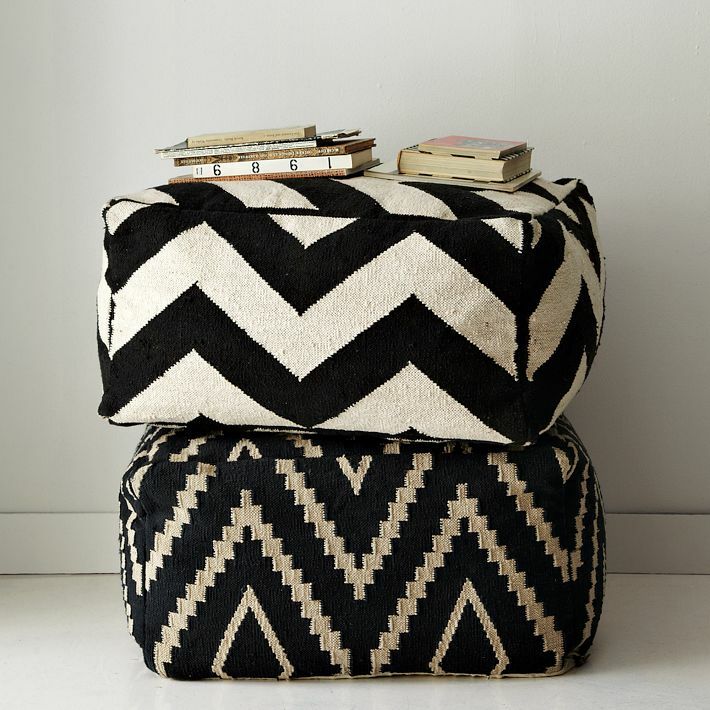 For a pillow + rug refresh leif shop & the PS2014 collection from ikea offer great finds. 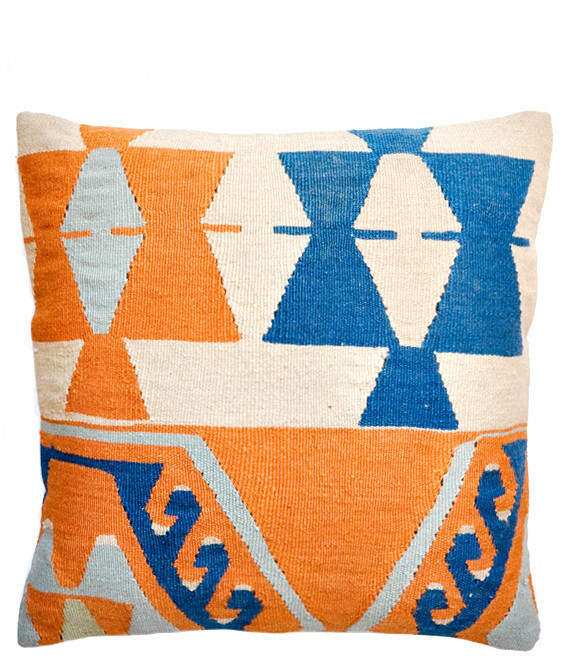 Currently love the desert ocean & cabo colormix woven pillows and the flat woven PS rug with geometric detail. Another way to add color into your space and truly make an interior landscape is to add plants. 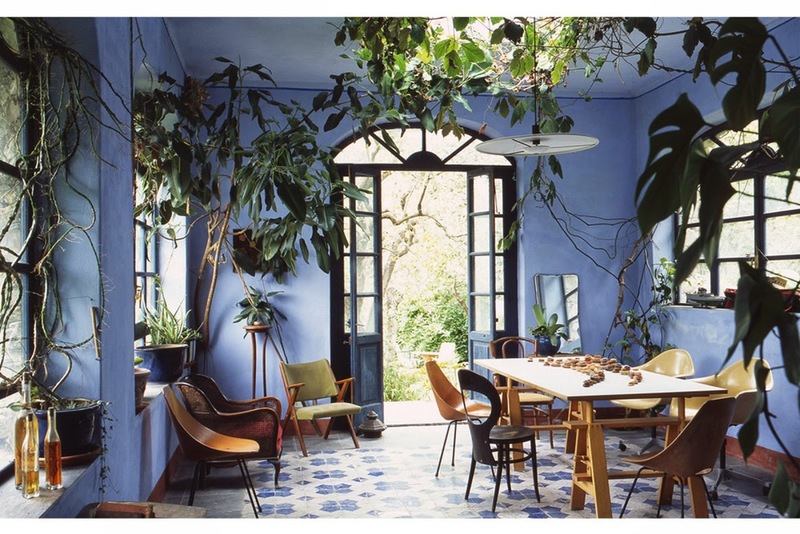 Love the found image of plants in a dinning space from the portfolio of photographer Claudio Tajoli. Livens up the already colorful space. Pattern is one of my favorite ways to incorporate color into a space. It can be done subtly with neutrals and pale tones, or the complete opposite spectrum. Whichever your preference, pattern is a perfect accent to creating a space that is fresh, inspiring, and classic with pops of whimsy. My automatic response to adding pattern is textiles. I love a pillow or three, and throw blankets. 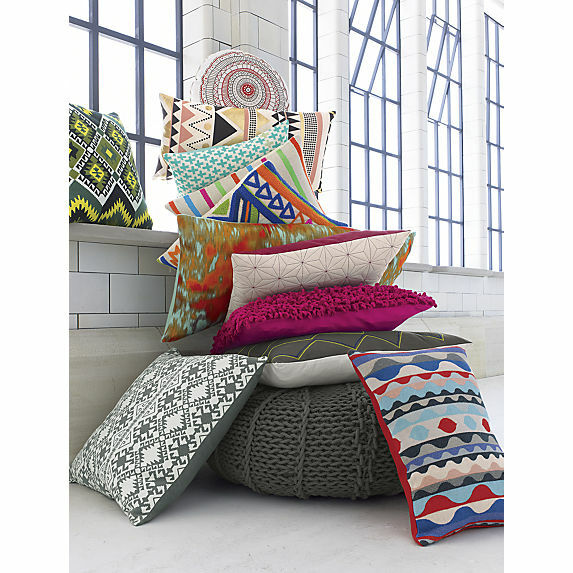 Cb2 has some eclectic pillow options, and Leif Shop always nails it with their pillows. A consistent favorite for patterned (colorful or monochromatic) throws is Caroline Z Hurley. 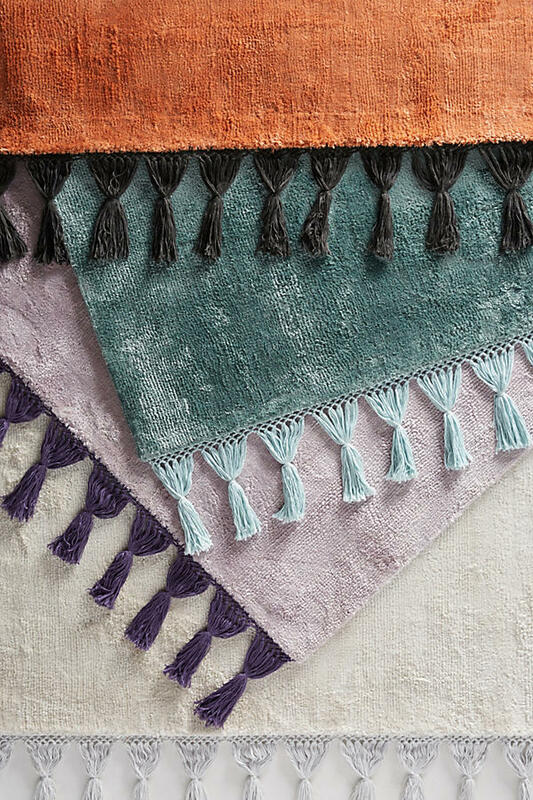 Her throws are perfect for adding springtime color to your space. Another way to add pattern is hand-painting your walls or using wallpaper.The modern-romantic wallpaper featured in an entry way is inviting, and its color palate of blues & greens complements the pinks, reds, and yellows of the textiles within the space. Love color & pattern! 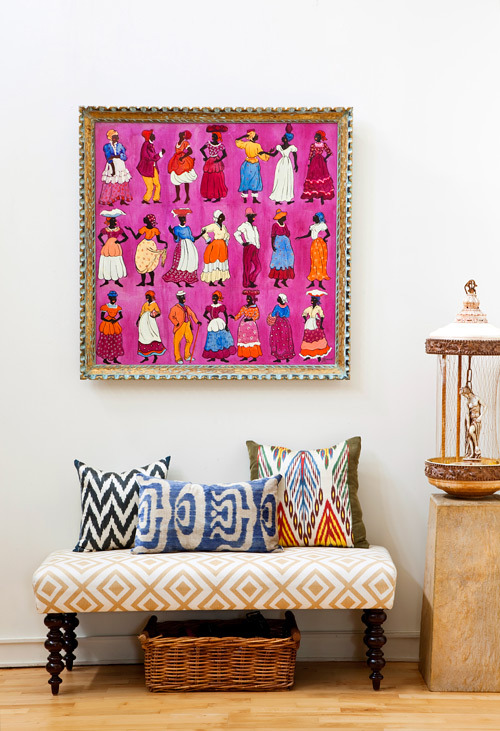 Mixing textiles livens up a neutral backdrop with an eclectic punch of color. But neutral textiles can bring just as much punch to a room as their colorful companions. Here is collection of my current favorite neutrals. Denim is a fabric I put in the neutral camp, because I think it goes with anything. 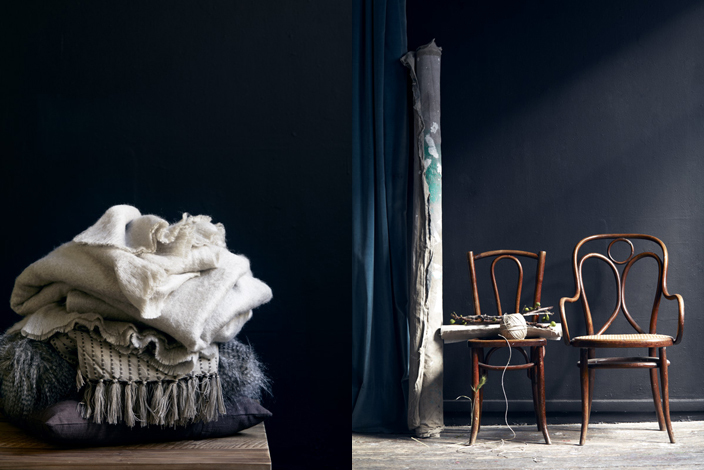 Caroline Z Hurley's linen throws (featured here in denim) are covet worthy. And if you want vibrant color punch, she offers lime greens, bright blues, and hot pinks too! Since winter is coming (and clearly I want GOT back on my tv) the Souk Pouf is a warm, cozy, and casual option for additional seating or as an ottoman. While your feet are resting on the pouf, you should wrap yourself in the blah blah wool throw. It's humorously warm. For underfoot, the ashdown wooden carpet by Eliza Strozyk is a must. Comprised of linen, oak, maple, and beech, her delicate geometric designs are tactile art-like furniture and furniture objects. Oyyo handwoven textiles are uniquely made and 100% organic. These blend simplicity with bold patterns. I want them all. 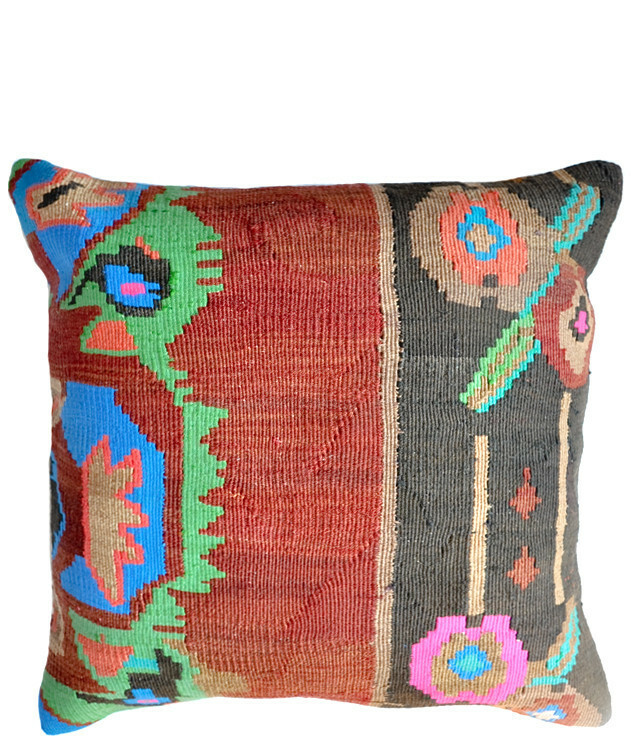 Pillows, blankets, throws, rugs, all of it, crafted from vibrant, vintage (or new) textiles reinvent a room. They bring color, texture, pattern, and volume. Summer is officially here in portland, and I have felt the need to reflect the warmer weather in my home. 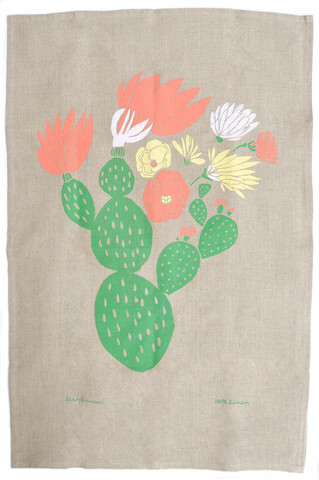 Leif is one of my favorite home-goods store, and the cactus tea towel + kilim pillow are delicate and fun colorful designs. What Jessica Helgerson (a Portland-based designer) has done for her clients Brooklyn brownstone is absolutely divine. A perfect showcase of introducing pops of color from textiles. 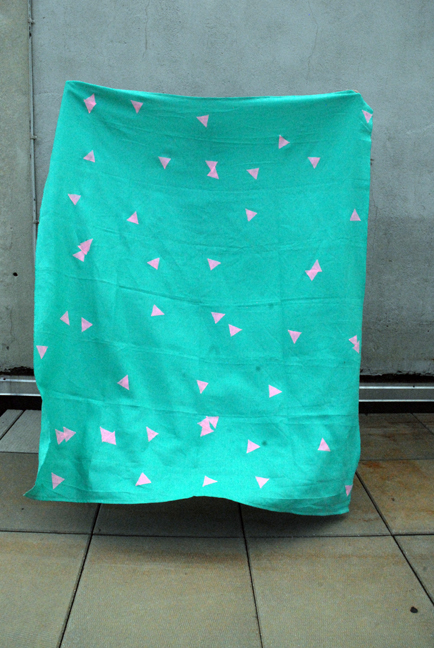 El Cosmic Provision's and Pattern Society are two places one must look to for textiles. 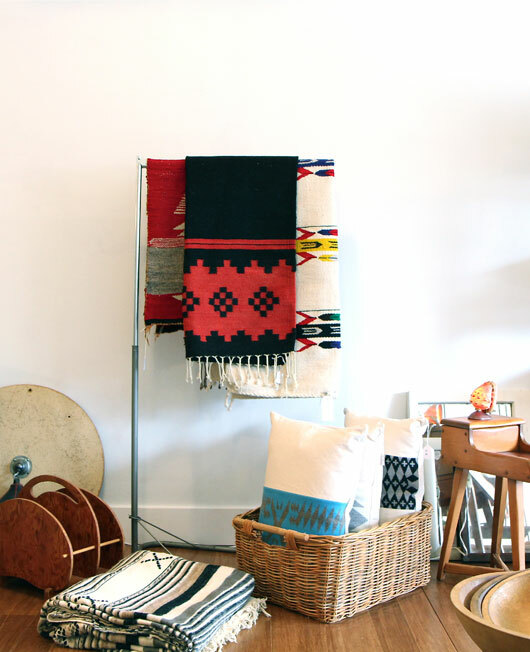 I love the Bolivian blankets from El Cosmic Provisions, and I will take anyone of those rugs featured on Pattern Society. Finally, I could not resist the bold geometric pattern of the varanasi stool from CB2. Color Punch, enjoy! Patterns. Patterns are my favorite color. I enjoy a space, piece of furniture, textile, art, architecture, or clothing that incorporates a pattern. 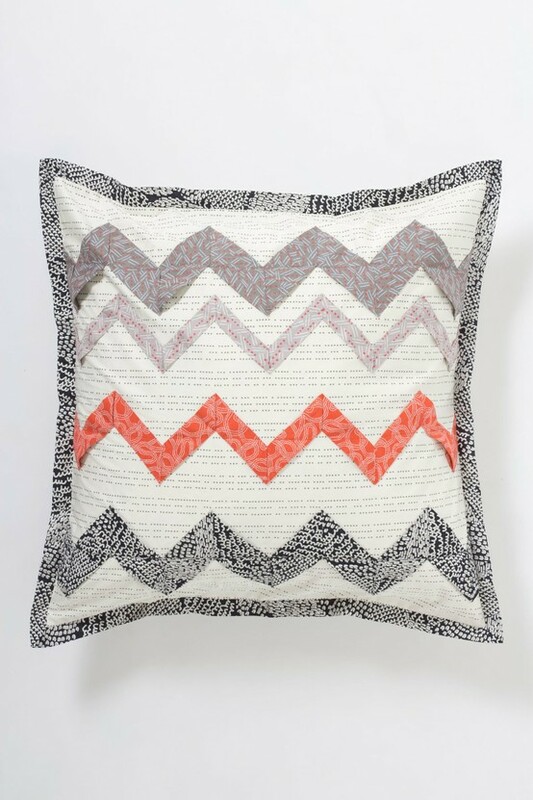 Put a monochromatic or incredible geometric pattern on a throw or pillow, and I can all but not have it. 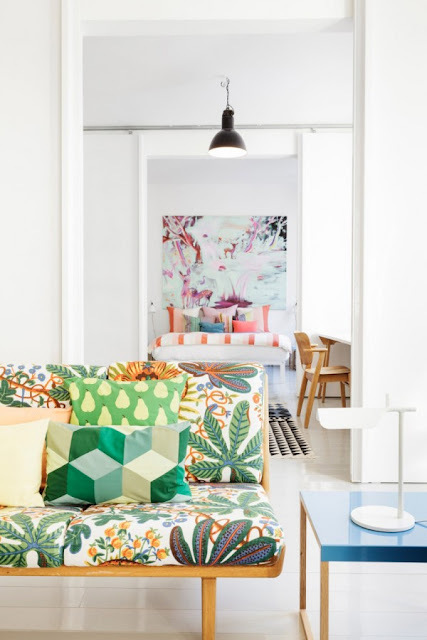 Luckily, spring is about bloom, which means it is about time to switch out the textiles and incorporate all things fresh, lively, and colorful. I love pops of color in a room. When the weather begins to get particularly gray outside (remember this is portland), color through textiles is a great way to bring light and cheer to a room. Above are some of my current favorites for the fall to winter seasons.